At Deer Valley Dental Care in South East (SE) Calgary, our dentists use dental crowns to cap a damaged tooth and help restore its function. Dental crowns are synthetic caps that your dentist places on the top of a tooth to help restore its function and protect it from any future damage. You may need a crown if you have had a root canal, or if you have a large filling or a broken tooth. Once in place, a dental crown can give your tooth more strength and can also help to correct bite issues, improve your speech, reduce the risk of gum disease, and improve your overall health. Metal crowns are made of gold. They generally last a long time, won’t chip or break, and tend not to wear down your surrounding natural teeth. Composite crowns are tooth-coloured. They won’t chip easily, but they tend to wear more quickly from chewing. Over time, tooth brushing may remove the polished surface of composite crowns causing them to stain more easily. Porcelain crowns are tooth-coloured and look like natural teeth. They are more brittle than metal or composite and may chip more easily. Porcelain-fused-to-metal crowns look natural and are stronger than porcelain or composite crowns so they won’t chip as easily. A dental crown generally takes at least two dental appointments to be placed. 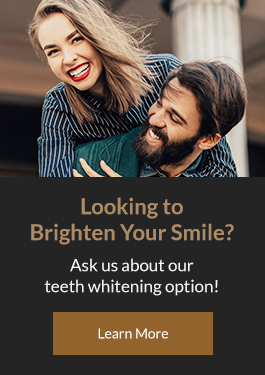 At the first appointment, your dentist will give you a local anesthetic and then gently file down your tooth to reshape it and make room the crown. Next, they will take an impression of your tooth so a custom crown can be made to fit your mouth. Your dentist will then place a temporary crown over the tooth to protect it until the final crown is ready. Your next appointment will take place when the crown is ready. At this visit, your dentist will remove the temporary crown, and then cement the final crown into place, ensuring a good fit. Get answers to our most commonly asked questions about dental crowns. Can porcelain crowns be reshaped? Yes, porcelain crowns can be reshaped and polished by your dentist. Can a dental crown be removed? The removal of an existing crown is possible. The condition of your crown and the material it is made from will determine how your dentist will remove it. How long before a crown feels normal? Crown sensitivity is common and usually goes away within 1-2 weeks after the procedure. If you notice pain when you bite, contact your dentist as the crown may need to be adjusted. When should a dental crown be replaced? The decision to replace a crown depends on a number of factors. The most important reason is if the tooth has decay underneath the crown. Over time crowns may also need to be replaced due to general wear and tear. Will I have tooth pain after a crown? Once the crown is placed, you shouldn't feel pain around the treated tooth. Some people may feel sensitivity from the surrounding teeth or the tooth that the crown bites against, but this should resolve within a few weeks. If it does not, contact your dentist. To place a dental crown, your dentist may first give you a local anesthetic to freeze the area so you do not feel any pain. Once the crown is placed, you shouldn't feel discomfort around the treated tooth. In some instances, sensitivity comes from the surrounding teeth or the tooth that the crown bites against, but this should resolve within a few weeks. If not, contact your dentist. What can you not eat with a temporary crown? It is recommended to avoid hard or sticky foods that may dislodge temporary crowns. The cost of a dental crown varies depending on the type of material you choose. Generally, crowns can range in cost from $800 to $1700 per crown. Some insurance companies may cover a portion of the cost. To be certain, check with your dentist and your dental insurance company. Dental crowns can be adjusted. The reason for the adjustment and the material your crown is made from will determine how your dentist will remove it. With the proper care, dental crowns can generally last for about 10 years or longer. Be sure to practice good oral hygiene and attend regular checkups and exams at your dental office. Like your natural teeth, remember not to bite down on hard objects or use your teeth to open or cut things.